Our West Hartford eye doctors treat Myopia and can provide a diagnosis - with a prescription - during your next comprehensive eye exam in our office. Nearsightedness, know as Myopia, is one of the most common vision problems, affecting 42% of Americans. Nearsighted people report headaches or eyestrain more often, and they squint or feel fatigued while driving or during sports. If the symptoms persist while wearing glasses or contact lenses, the corrective prescription may need adjustment. Myopia occurs when the eyeball is slightly misshapen, longer than usual, from front to back. This causes light rays to focus at a point in front of the retina, rather than directly on the surface. Nearsightedness runs in families and usually begins during childhood. This vision problem may stabilize at a certain point, although it also may worsen with age. Nearsightedness is mostly corrected with glasses, contact lenses or refractive surgery. Depending on the degree of myopia, you may need eyeglasses or lenses all the time, or only when sharper distance vision, like driving, or viewing a chalkboard, movie etc., is desired. If your glasses or contact lens prescription begins with a minus number, e.g: -2.00, you are nearsighted. Refractive surgery is a more “permanent” option for correcting myopia. This includes laser procedures such as LASIK and PRK, or non-laser options such as corneal inserts and implantable lenses. One advantage of the non-laser options is that, although they’re intended to be permanent, they may be removed in case of a problem or change of prescription. Orthokeratology is a non-surgical procedure where special rigid gas permeable (GP) contact lenses are used to slowly reshape the cornea during sleep. After the lenses are removed the cornea retains the new shape. The patient can see clearly during the day without wearing glasses or contact lenses. 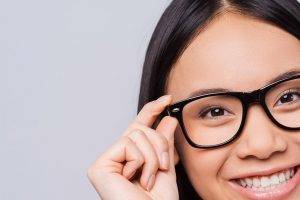 Contact us today for help with your or your child's myopia.